What are you willing to go through to get your nicotine fix? Most people I know simply go to the nearest convenience store and buy a pack of cigarettes. Marlboro Lights, Camel Lights â€“ name the brand, youâ€™ll find them easily most anywhere. The problem these days is that, despite easy enough access to cigarettes, the finances involved arenâ€™t that â€œprettyâ€ anymore. Smokers all over the United States have been battered by ever increasing taxes, not to mention smoking bans left and right. While we canâ€™t do much about the smoking bans, there are workarounds to the increasing prices of cigarettes. For example, have you ever thought about rolling your own cigarettes? Manufactured cigarettes, like the branded ones I mentioned above, are the ones which are taxed highly. However, you can buy tobacco leaves and rolling papers and create your own smokes, which are just as good AND definitely much easier on the pocket. Rolling papers are basically small sheets of paper which can be used to make cigarettes. They can be rolled manually or by machines. Rolling papers can be made of various materials, but the most common base materials are hemp, wood pulp, and flax. The market is rife with both tobacco leaves and rolling papers. You merely have to know where to get them and which ones to get, and you can make considerable savings while enjoying your smoke. A note of caution with regard to rolling papers â€“ there are a LOT of brands that you can find in the market today. You have to know which brands are good however, as the material used to make the rolling paper can affect the flavor of your cigarette. There are also some papers which have been reported to contain elements that are higher in carcinogens. If you want to be sure, look for reputable suppliers such as Rolling Supreme, which offers some of the best rolling papers there are. They also offer tobacco and other accessories which will help you roll along and bypass the headaches of high cigarette taxes. Try rolling your own cigarettes. You might never have to buy a pack from the store again, and have a fatter pocket for it! Have you ever heard of this special kind of cigar which is made for someone (or something) else other than the stogie lover with two feet (read: humans)? Well apparently, there are cigars which are meant for the four-legged variety. Laugh if you will â€“ I did â€“ but this is for real! Chewgars are â€œcigarsâ€ which are meant especially for your lovable dog. For stogie lovers who have dogs, youâ€™ve probably noticed how they react when you light up. In general, I have noticed that my friendsâ€™ dogs (I donâ€™t have one) seem to be wanting to enjoy what their owners are also enjoying. I donâ€™t know if itâ€™s the aroma that the cigar is giving off. I donâ€™t know if itâ€™s the smoke â€“ heck, I really donâ€™t know. The fact remains that sometimes, when you smoke a cigar and your dogs are with you, you just want to share your pleasures with them. I am sure some of you have done the same thing with beerâ€¦. 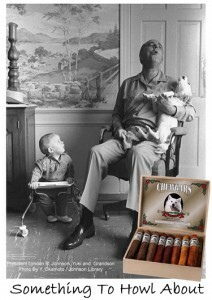 Anyhow, you can get chewgars so that your canine friend will be kept busy as you smoke your cigars. Chewgars do not really contain tobacco, so they should be safe for your pet. The fun part is that chewgars are shaped just like cigars and are even packaged just like real ones! They are made of rawhide and come in various flavors â€“ chicken, beef, and even chocolate! If youâ€™re worried about other health concerns, really you shouldnâ€™t. these products are guaranteed to be pesticide-free, and will not harm your dog.